Derby County chief executive Sam Rush has insisted their end-of-season review must not be too "draconian" and risk losing sight of the club's progress. A dismal run of just two wins in their last 13 games meant the Rams missed out on a Championship play-off place on the final day of the season. Rush told BBC Radio Derby there was no way to "dress up" the disappointment. "But you have to look at the whole and be a little bit careful not be too draconian in any assessment," he added. "We are delighted with the progress we have made and we are confident we will have an excellent summer and be in great shape for the start of next season." 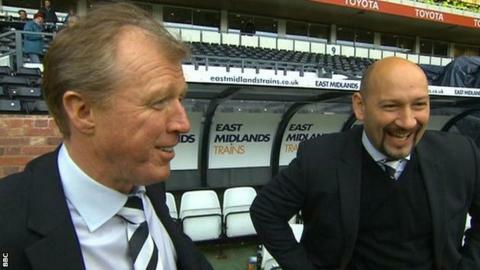 Rush took over as CEO in January 2013, with McClaren becoming manager in September that year. The former England boss guided Derby to the Championship play-off final last season and the Rams were leading the table in February this year before slipping off the pace. Rush said: "The initial remit when I came to the club just over two years ago was to ensure that Derby were legitimate contenders in this league and had realistic prospects of promotion. "We have come extremely close on both occasions. We haven't got there, so any planning and reflection will have more than a tinge of disappointment. "But equally we can see lots of things that have worked well; the number of fans we have packing the stadium, the number following the team away, the way the club is perceived generally and the quality of players."